Badminton has been a regular feature on the Tom Newby activity calendar since the 1980s. Our team has, during this period, regularly won the A league and many of our badminton players have been selected to represent provincial and national teams. Although Badminton is an official school sport, the services of a professional badminton coach are utilized to ensure that TNS players are adequately coached. The cost for this coaching is R300.00 for the year. Badminton is offered to all children from Grade 1 – 7. The Badminton season runs from March to November. Practices and matches are held at the John Barrable Hall. Please consult the extra mural schedule for practice times and days. Badminton players are required to provide their own transport to and from practice and match venues. Badminton practice and match uniform is the TNS PT kit with white takkies. 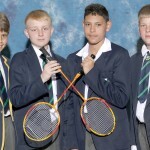 The school is able to provide racquets and shuttlecocks to players but it is advisable for players to own personal equipment that will put them in a position to play to the best of their ability.